After two years of pressure from activist shareholders New York REIT is liquidating its portfolio of 19 landmark office and retail buildings in Midtown Manhattan. Properties on the balance sheet are fully rented and have 9+ years of average remaining lease term. Company trades at 30%-40% discount to NAV and liquidation is expected to be finalized in 12 months. There is minimal downside risk as even very conservative RE valuation assumptions lead to positive return relative to today's share price. Appointment of new external manager and gradual distributions of liquidation proceeds will close the gap between NAV and the share price. And while investors wait for liquidation they are getting paid 5% in monthly dividends. New York REIT has a world class portfolio of 19 landmark office and retail properties across Midtown Manhattan. These are very stable properties with high quality tenants and average remaining lease term of 9+ years. List of tenants for each property can be found here. Moreover, lease contracts with majority of the tenants were signed during/right after the crisis which resulted in rents being 10%-15% below the present market prices. Thus assets are potentially more profitable than currently appears. In August/October 2016 management announced plan of liquidation and issued Requests for Proposals to serve as NYRT's external manager (14 proposals received, one of which is from WW Investors). The company also reached settlement with activist WW Investors and 3 new independent directors have joined the board. Shareholder vote on liquidation is set for 19th of December and I expect it to be easily approved. New external manager in charge of liquidation will also be selected by the end of December. So the liquidation process will begin in Q1 of 2017 and the external manager in charge of it is likely to be far more incentivized in maximizing shareholder value than the current one. Liquidation process itself should be relatively fast and straightforward keeping in mind that Manhattan is one of the most liquid office RE markets in the world and that NYRT portfolio consists of high quality and almost fully rented assets. External adviser proposed by WW Investors estimates that liquidation should take maximum 12 months. 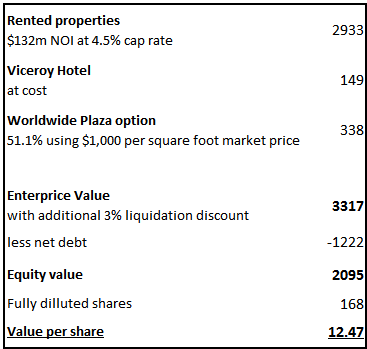 For valuation purposes I split NYRT's assets into three parts: (1) rented properties, (2) Hotel Viceroy and (3) option to acquire 51.1% of Worldwide Plaza below market rates. Any acquirers would obviously be more interested in potential NOI that the assets can generate rather than the current NOI. To arrive at stabilized cash NOI, management adds contractual rent free burn, contractual rent increases and stabilization of 1440 Broadway property. While I agree with the first two (these are in agreements with the tenants), the third seems more questionable keeping in mind that occupancy at 1440 Broadway has been declining over the last few quarters and management so far was not able to replace the leaving tenants. Excluding 1440 Broadway stabilization and Viceroy Hotel, I arrive at cash NOI of $132m. Additionally, management and activist investors have repeatedly explained that current contractual rent rates are 10%-15% below market prices. Data from Manhattan Office Market rent review also show that NYRT rents are below market levels. Thus the $132m of estimated cash NOI is probably conservative and properties are likely to become more profitable when current leases roll-over. For cap rates, recently office property deals Manhattan seem to be done at 4%-4.5% rates (here and here). At these rates and using $132m NOI the rented part of the portfolio would be valued at $2.9bn - $3.3bn. Hotel Viceroy is a 5 star hotel next to central park with 240 rooms. It was acquired newly built in 2013 for $148.5m, equivalent to price of $620k per key. As hotel was opened only recently, it still needs to reach full potential - occupancy during the latest quarter has improved from 86.4% to 90.4%. As the hotel at the moment generates only minimal profitability, NYRT has taken impairment on the property during the latest quarter. "Select service" properties such as Marriott Courtyards typically trade for between $400,000 to $500,000 per key, McConnell says, compared with $850,000 to $1 million per key for four-star properties which include restaurants and ballrooms." With Viceroy falling somewhat in between 'Select Service' and 'Full Service' properties, the value of $620m per key looks reasonable - and thus historical cost ($148.5m) for Viceroy Hotel valuation looks appropriate. NYRT purchased 48.9% of One Worldwide Plaza in 2013 with the option to acquire the remaining stake at $678 per sq. ft., which is significantly below the current market prices of office properties in Manhattan. Company has until the end of the year to exercise the option and it is already seeking to obtain new financing to execute this deal before starting the liquidation. The table below provides illustration of option value using various per square foot pricing points. "NYRT owns an iconic New York City building in Worldwide Plaza. While rents are significantly below market due to unfavorable leases consummated in the depth of the recession, we see no reason this asset could not fetch $2.5 billion (or $1,200 per square foot), if marketed to the right buyer - a patient, long-term investor." Thus $1,000 per square foot sounds really conservative. At $1,200 per square foot, the option to acquire the remaining stake would be worth $546m. The tables below show the total valuation of company's equity as well as per share price sensitivity using different assumptions for cap rate and per square foot price for Worldwide Plaza. My conservative estimate of fair value is $12.47 per share or 32% upside to current prices. This estimate does not take into account that portfolio rents are currently 10%-15% below market value or that company's high quality and fully rented assets could probably easy fetch better valuations than 4.5% cap rate. Even with high cap rate of 5% and $900 per square foot pricing for Worlwide Plaza the resulting NYRT valuation is still above the current market price ($10.17 vs $9.40). Thus even with overly conservative assumptions the liquidation would still result in 7% upside for shareholders. Due to already very low share price and high quality of assets downside risk for this trade is absolutely minimal. In the presentation before the public listing, management estimated per share prices of $13.5-$16.2 if the company traded at the same FFO and AFFO multiples as peers. Sorin Capital wrote that Company's shares were trading at more than 30% discount to their estimate of fair value, indicating expected valuation of $13.3 per share. Gregory Cohen wrote that discount to NAV is 40%, indicating fair value of $15.5 per share. He also mentioned that "It's almost embarrassing NYRT trades at a 5% dividend yield (and an implied stabilized cap rate of 5.5%) when comparable Class A Office REITs trade closer to a 2% dividend yield and significantly closer to NAV"
Jonathan Litt indicated NAV of $14/share. WW Investors using information provided by management arrived at liquidation NAV of $11.39-$12.31 per share. In the proposal to be external advisor, WW investors indicated that they would charge incentive fees only after distributions to shareholders reach $11/share. So WW Investors are willing to carry out the whole liquidation work for free if their assessment of fair value is incorrect. In April 2014 NYRT launched tender offer to buy back 14% of the outstanding stock at $10.75. Yet the offer was significantly undersubscribed - majority of shareholder clearly valued the company higher and were not willing to use the liquidity event. "In the early days as a listed company, we had no sell side research coverage so, to help give direction to the market, we did estimate our own NAV which is, as you said at the time, I believe was at or around$12.49. Now that we have sell side research coverage, we're not going to estimate our own NAV publicly, but I will just comment that I think the market has only improved since that time - rents are up in New York City, cap rates are down, there is a lot of demand for real estate in the city." Overall, I believe investors are making a very safe bet in purchasing NYRT stock at $9.4 - the chances of liquidation resulting in lower distributions than the current share price are very slim. Downside is well protected as even very conservative RE valuation assumptions lead to positive return relative to today's share price. Hi, thanks for the write-up. The company announced (http://www.snl.com/IRWebLinkX/file.aspx?IID=4246025&FID=36452848) they will suspend their dividend in November and December pending liquidation approval. If the liquidation is approved they intend to pay out periodic liquidation distributions in lieu of current monthly dividends. Thanks for correction. Indeed regular dividend has been suspended. Do you know if these liquidations normally pay out the proceeds as ordinary dividends? As a non-US investor, I’m trying to work out if I’d get stung with withholding tax on all the liquidation distributions. Dividends can be paid from profits only and anything else would be regarded as return of capital. So my understanding is that all the sales up to BV of the properties will be classed as return of capital and anything above BV could be classed as dividends (after operating costs are deducted). What do you make of the $8.73-$11.50 management estimates in distributions? Do you think they are being conservative or could transaction fees eat up much of the profits? – Management did not want to start liquidation (as they would loose their jobs) and did eventually start it only in response to shareholder pressure. So to save their reputations I believe they low-balled the likely distributions. – Management’s estimate directly contradicts their statements of $12.49+ NAV made a year ago. Manhattan real estate market only got more expensive in the meantime. – This distribution estimate was made taking into account the fees of old adviser. Now the company is looking for cheaper adviser to be in charge of liquidation. Due to the above I would not pay much attention to management’s estimate. My own calculations and those of activist shareholders seem to be closer to reality. I already include 3% of transaction costs (which is c. $100m) in my fair value estimate. Also keep in mind that company will still be generating cash when liquidation will be ongoing so that should take care of any additional transaction costs. To arrive at $8.73 per share valuation, really ridiculously negative assumptions are necessary – 5.5% cap rate (unheard in Midtown Manhattan), $900 per square foot value for the Worldwide Plaza option, 3% liquidation costs and no additional cash generated while liquidation is ongoing. Even with low per square foot valuation of $900, the remaining rented properties are worth $2.9bn (in line with my valuation table). Worth noting that the sold properties are outside Manhattan, whereas all of the remaining ones (except one) are in Manhattan. If sold properties can serve as any indication on what the remaining portfolio is worth then $2.9bn looks very conservative. If NYRT can fetch anything close to these averages then value per share in liquidation stands at $16, way above what I estimated for my base case. This gives further confidence that loss of capital at the current share price is very unlikely. A slightly more negative sign is that the number of deals in Manhattan has declined over the previous year and that cap rates increased by 9 basis points – so Manhattan CRE market might be starting to cool down. But with liquidation to be finalized in one year, this should not pose much of the problem. It appears NYRT values the portfolio based solely on NOI of $162mm at a 4.2-4.7% cap rate (p60 of the prelim proxy). This would undervalue the minimally profitable Viceroy. Nevertheless they estimate gross real estate value at $3.5-3.9 billion- in your range. They estimate transaction costs at $168-183 million. Subtracting out $364mm in mortgage notes, $485 from their credit facility, and their pro rata share of the Worldwide’s $875 in debt and adding back corporate cash I arrived at a similar figure as you. This leaves at $0.2-1.0 billion gap between their calculations and our-back-of-the-envelope numbers. I wonder why such a large difference? 1) NOI of $162m including full WWP. Management arrives at this figure by annualizing Q2 2016 run-rate ($121m) and then adding additional NOI from the 51.5% of not-yet-acquired-WWP ($41m). The problem is that this NOI does not adjust for any rent-free periods which will soon expire or other contractual increases in rents (as per management’s presentation). Adding these back results in NOI of $178m counting all properties with full WWP (but excluding Viceroy stabilization and 1440 Broadway stabilization). My thinking is that buyers will assess the potential earnings instead of historical ones, especially when these potential earnings are already in the lease contracts. This updated NOI results in $11.6-$14.2 share price ranges. 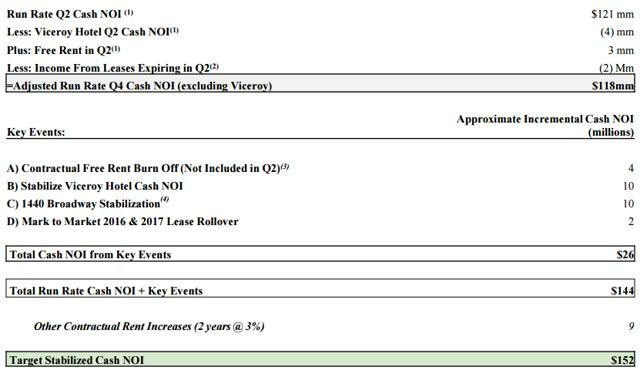 2) Viceroy Hotel is valued at only $4m of annualized NOI, which results in Hotel valuation of $85m-$95m, instead of purchase price (newly built 3 years ago) of $150m. One could argue that NYRT overpaid by 5%-10%, but clearly not by 40%. The difference in hotel valuation adds further $0.4/share. 3) Adviser fee – my estimate of $100 vs. management’s estimate of $183. While I do not have much to support for my figure, management calculated their estimate based on fee structure of the current adviser and I believe new adviser is likely to be more cost effective (WW Investors posted fee comparison table in their 29th Sep filling), at least till $11/share distributions are reached. Hope this sheds some more light on why I am skeptical with regards to management’s estimate of the likely distributions. ww investors has 12 months for the liquidation. sometimes these seem to take longer than originally anticipated. any idea what the worst case time to completion is if obstacles come up? thanks so much in advance! So even if 12 months might be too optimistic, I believe shares of NYRT will go significantly upwards when first properties are sold and first distributions are made. So if we look at time too value realization instead of time to full liquidation, then 12 months is likely very conservative. Just my humble thoughts. Hi dt, any thoughts on the proxy issued on Dec 9 regarding the Dec 30 Annual Meeting? Potentially 3 catalysts for the stock in December – new adviser, financing for WWP option and shareholder vote for liquidation. Although all of these are supposedly well known by the market, positive announcements should push the share upwards. And obviously if anything goes wrong on any of these three items (in my opinion probability is quite low) the stock will get crushed. I also found nothing materially new in the proxy. Just wondering what was your opinion on the document and if you’d found anything. Hi, looking at the 10Q it seems they have until June 2017 to exercise the Plaza option. So they do have plenty of time to sort out financing still. My mistake. Don’t know where I got the Dec 2016 for option exercise. As you suggest option can be exercised during Jan-Jun 2017. Just keep in mind that valuation is very sensitive to cap rates. Agreed fees seem to be in line with the structure proposed by Winthrop back in Autumn. Their incentive fee kicks in only if distributions exceed $11/share. Also Winthorp has been instrumental in the liquidation decision so now their reputation is on the line if liquidation results in lower returns than previously communicated to shareholders. Another positive development – secured financing for WWP option exercise. Any idea why stock is selling off after shareholder approval? 1) We might be observing a simple ‘buy on rumors, sell on news’ phenomena. Shareholder approval was widely expected, still some shareholders (including me) thought that actual event of that would push the share price at least slightly upwards. Maybe some bought-in just in expectation of that. When the expected share price reaction did not materialize, these shareholders started exiting the position. It is only 2% price change and there could be myriad other factor for this kind of daily move. Fundamentally there has been no new info that would pressure the price downwards. I think the situation has been significantly derisked by the events over the last month. I tend to ignore these daily fluctuations. probably looking too much into it. I have a lot of confidence in NYC real estate market and agree with your thesis. Blake, please see my reply above. Q:	What will I receive in the liquidation? Daniel, well spotted. However, I do not believe that estimate of previous adviser is very relevant here. Keep in mind that their liquidation range had to be low enough to justify the JBG merger. Also keep in mind that estimate of previous adviser includes dilution from 7.7m of unearned LTIP units (5% dilution). However, these units expire on the 15th of April, 2017. I am pretty sure Winthrop will make sure that there are no distributions prior to this date. So one can lift up management estimates right away by 5% upwards. Don’t really catch the meaning here. I mean, don’t really know about the JBG merger and what is LTIP units and why the dilution. Thank you. To be specific, why the previous advisor had to keep the liquidation range low to justify the merger? And for the LTIP, does it mean that there’s $7.7m worth of new stock to be issued in case of employees exercising their LTIPs? If the $7.7m worth of shares are to be issued (on 15th of Apr 2017? ), the value of each share will be diluted by 5%, is that the case? FM, previous adviser had incentives to keep the liquidation range low in order to convince shareholders that merger with JBG is better choice than the liquidation of the company. Activists then stepped up arguing that situation is actually quite the opposite (i.e. liquidation better than the proposed merger). As for LTIP plan, you explained it yourself. Under the plan there were 7.7m (number of shares rather than value) of unearned stock compensation that could be potentially issued to previous adviser. However, only a small portion of that 7.7m of unearned units is likely to be earned till mid April 2017 and after this date all unearned units will be forfeited. Thus dilution is expected to be far smaller than calculated by previous adviser. I’m a non-US investor. My broker is IB. I have some positions on it. How will I be taxed? I found that BINDQ was taxed as dividend. Does that mean I will be taxed $1.25–1.5 per share (10%)? My expectation is that majority of distributions will be treated as return of capital or Winthrop will find some other tax efficient way to make these distributions. As a foreign investor, depending on the country you are from, you would be taxed witholding tax on any dividend distributions only, but not on return of capital. This is a quote from Stash Graham from Regis Equity Partners. Indeed large volume was the result of index funds selling out of NYRT. It is interesting that market was able to absorb such a huge selling pressure (1/3 of all outstanding shares on Friday alone), by dropping only 3%-5%. Clearly downside is well protected here. I have significantly increased the position and consider it to be a good alternative for holding cash at the moment. Does the 1.8B estimate include the option? Yes, it does. But the article mentions 1.8m of sq. ft. being for sale when the whole of WWP is c. 2.05m sq ft in area. So likely some parts of the property (parking spaces and etc) are excluded from the sale and would be incremental. If the tower is sold at this price, it should go a long way towards my bullish case. – Huge disagreements on major decision approved by the board – not entirely clear what those decision were. Was it only the ones listed in the letter (the only major seems to be appointment of new advisor) or were there any others (eg. sale of the company to early bidders). – Double fees for external advisors during 3 months transition period. Q4 result announcement should shed more light on what is going on. So far one can only speculate what does this disagreement really relate to. – Fully diluted share-count stands at 168.7m and will likely increase further (by c. 0.5m) as previous Adviser will have a chance to earn further incentive units till Apr 2017 until the contract fully expires. This share-count is slightly (c. 0.5%) higher than I initially modeled. There is still no further clarity on some the comments made by the departing director. – No further impairment on Viceroy – so it might be the case that director was referring to $28m impairment taken in Q3 2016. – No reference to default on corporate debt during Q4. In any case the whole previous debt was refinanced in Dec 2016. A corporation in which Ms. Silverstein is the sole shareholder is a party to a consulting agreement with the Service Provider pursuant to which she receives a consulting fee for providing services in connection with the services provided by the Service Provider pursuant to the Services Agreement and is entitled to receive 50% of any Incentive Fee (as defined in the Services Agreement) that may be payable to the Service Provider pursuant to the Services Agreement. As we know the Incentive Fee kicks in only if distributions exceed $11/share, of which 50% go to WW and the other 50% goes to the current NYRT CEO. Good alignment of interests both on a corporate level and on a personal level with the CEO. If we assume that the distributions are $11.5/share,this means that the shareholders will get $11.5/share – the Incentive Fee? Also do we know the % of the Incentive Fee if the distributions are above $11? In the WW investors information document they said that they will charge a 10% incentive fee if the distributions to shareholders are excess $11/share. But what they mean by that? If for example the distributions are $11.01/share they will charge this($11.01*10%=$1.101/share) or this ($0.01*10%=$0.001/share). Makarid, you should calculate the incentive fee on an absolute basis instead of per share basis. $11/share is equivalent to c. $1.85bn total distributions. If for example final liquidation proceeds result in $2bn, then the incentive fee would be ($2bn – $1.85bn) * 10% = $15m. DT, forgive my total ignorance about the NYC real estate market, but I still don’t get the NYRT play. Money is typically made in liquidation situations when there is either (1) excessive investor pessimism (I.e. emotion), or when there is (2) widespread ignorance (I.e. Knowledge) about the true value of the assets. Here I don’t think there’s excessive pessimism and I cannot fathom that there would be ignorance about the true value of NYRT’s assets. This is a $1.5B+ REIT with assets in the heart of Manhattan, for goodness sake. There have to be dozens or hundreds of money managers aware of this situation. Is the idea behind the play here that the likely cap rates at which these properties in NYC will sell are currently being excessively discounted by investor pessimism about the Fed’s rising rate environment? It surely can’t be that money managers are unaware of the fact that the rent contracts in these properties were signed during the recession and thus are below current market rates. That’s something that money managers have been dealing with for years. It also can’t be the structural fact that some funds are not able to hold securities that are in liquidation proceedings, because there have got to be a number of other such funds that can in fact hold such securities. So where is there an inefficiency that the market isn’t seeing in this highly visible REIT liquidation, and that would cause this liquidation to have per share upside of $10, $11, $12, or more like I’m seeing in this thread? Thanks! That’s a very good question and I have thought about it as well a number of times. You correct that NYRT is definitely not a hidden secret anymore and also large enough (in terms of market cap) to be interesting for smaller asset managers. I was expecting that all the catalysts that happened last year would lift the share price closer to what I believe is the true NAV, but that did not happen. I think that there is no longer any market inefficiency with regards to NYRT, but rather difference in opinion. – The key point here is that bulls attach high likelihood of Winthrop keeping up their promises in light of good track record with a similar liquidation story. Whereas more pessimistic investors might want to see actual liquidations above BV before putting any trust in Winthrop. – Also the portfolio is composed of only a few properties and nobody knows for how much exactly these will be able to sell for. Each property is unique and two buildings nearby might sell for different cap rates. So any valuation estimate is literally only an estimate. And due to leverage a tiny difference in cap rates results in material differences in per share valuations. So this comes again to believing in Winthrop and their ability to liquidate properties profitably. – Another factor is interest rates – bulls think that Manhattan property values and cap rates will not be affected by rising interest rates within next year and bears have the opposite view. – Finally, bears think it will take much longer than one year to liquidate the portfolio and therefore higher discount is applied due to time value of money. – Also a big part of shares are held by ETFs so there might be some selling pressure for reasons completely unrelated to NYRT situation. Let’s assume, as I think we must, that the market is fully aware of the discount to NAV. Why then does the discount persist? Last fall it might have been justifiable because of uncertainty surrounding shareholder approval and other necessary liquidation hurdles. But, having passed those hurdles, I think that there are a couple of explanations for why the market remains skeptical. 1) The obvious one is that general Trump bullishness has convinced the market that there will be multiple hikes, and that hikes will cause NYC cap rates to soften. If there are multiple hikes, then NYRT’s high book NAV becomes stale (and irrelevant) information because it arose in a different rate environment. In this case NAV doesn’t matter and NYRT is a commoditized REIT liquidation with nothing to distinguish it from any other REIT liquidation. 2) Also possible is that the market doesn’t trust (a) Winthrop’s shareholder-friendly incentives or (b) Winthrop’s liquidation abilities. (a) seems unlikely because of recent contractual developments. (b) makes more sense, especially when coupled with (1) above. Winthrop may be a skilled liquidator, but in a situation that’s this publicized, and in a rising rate environment, the liquidator becomes a motivated/handicapped seller who is facing a weakening market. Either the liquidator has to settle for lower sales prices or has to extend the length of the liquidation. And NYRT shareholders have been growing impatient, which might force sales to happen on a seller-unfriendly timeline. At this point, betting on NYRT liquidation might only make sense if one believes that there won’t be hikes (a macro event that’s hard to predict) or if one has special knowledge of the NYC real estate market and thinks that hikes won’t impact cap rates (a level of knowledge that few people have). mpawder, your thinking is more or less in line with what I have written. I would be expecting some kind of statement from Winthrop on how the liquidation is progressing shortly. That is likely to give more clarify on how high is the demand for portfolio properties. Also not sure what you mean by “commoditized REIT liquidation” – are you aware of any other REIT liquidations currently? Nothing current, dt. I’m just thinking of past REIT liquidations which did not yield any special share price gains for their shareholders. I agree with you that it is best to wait for management updates before jumping to any conclusions about this situation. Thanks for the good feedback. 10:59 AM EDT, 03/31/2017 (MT Newswires) — Through a wholly-owned subsidiary, New York REIT (NYRT) exercised its right to acquire the remaining 51.1% interest in Worldwide Holdings LLC (Worldwide Plaza) that the company does not currently own. The Worldwide option was exercised pursuant to the company’s rights under the joint venture agreement for Worldwide Plaza and is subject to the Worldwide Plaza’s joint venture partner’s right to retain up to 1.2% of the aggregate membership interest. In connection with the New York REIT’s exercise of the Worldwide Plaza option and as required by the joint venture agreement, the company deposited $30.0 million in escrow. Based on a formula that incorporates the percentage being acquired and the option price for Worldwide Plaza of approximately $1.4 billion, minus the principal balance of the outstanding mortgage and mezzanine indebtedness, the purchase price for the call interest will be approximately $269 million. The closing of the transaction will not occur earlier than April 29 or later than June 28. Exercise of the option was expected and communicated by management, so market was already pricing this in before. Regarding the taxation of future distributions, I have been trying to understand a good way to estimate capital gains. My best guess is that, like you said above, liquidating amounts above the gross book value of the properties will be capital gains, and the rest a return of capital. Thus ~62.5% of liquidating distribution would be return of capital. The remaining ~37.5% would be capital gains. So, if Liquidation Value less debt repayment and expenses was $2.1b ($4.0b – $1.9b), liquidating distributions would be $12.5/share. $7.81 would be classified as return of capital, and the remaining $4.69 would be capital gains. At 20% capital gains, there would be a $0.94 tax on the NYRT 1099 (assuming all properties got sold in the same year, and there was only 1 liquidating distribution). So, you would think that investors wouldn’t buy shares for $12.00 for example, if they were assuming $12.50 in liquidating distributions along with about $1.00 in capital gains taxes – $11.50 value net of tax. (Perhaps investors using an IRA are an exception). If this analysis of the general tax ramifications is accurate, that may explain part of the discount to NAV that NYRT is trading at currently. A takeaway (perhaps obvious) is that a REIT liquidation with a higher tax basis on the properties is more attractive, everything else equal, than a REIT liquidation with a low tax basis on the properties, like NYRT. Any thoughts appreciated. I’m not certain if the calculation above is a good way to estimated capital gains or not. NYRT free falling on management $9.25 estimated liquidation value, why are their figure so far from the $11-$12 expected liquidation value? Looks like NYRT is trading down ~10% after hours to $8.75. It looks like the liquidation math is going to result in a distribution of only $9.25/share, though it looks like there is some wiggle room to this. Seems management lowered expected liquidation price to 9.25 ? What do you think about the sharp drop in price today after-hours? I am as baffled as any other NYRT investors. This liquidation estimate of $9.25 contradicts every single NYRT analysis I have seen as well as market realities. WWP option seems to have almost no incremental value, suggesting that management is valuing WWP close to the option exercise price, i.e. $700/sqf, which is way below any comparables in the market. Conference call today will shed some light on what is happening. Is the management in any kind of incentivized situation to keep the estimated liquidation price low? Not that I am aware of. The only reason I can think not to over-promise and then fail to deliver. But $9.25 seems to be far far below any kind of over-promising. Potentially the sale of WWP is going far worse than Winthrop guys expected. I believe under GAAP liquidation accounting that they cannot account for this until the option is fully executed. Therefore management had to provide the value as it was as of the end of the quarter. If I am correct there is a large mispricing right now. It would be nice to have the estimated values on a property by property basis. Thoughts? I’m not sure whether this got to do with accounting standards or not. But if it does, I believe the management should point it out in the call right? This is an estimate, not disclosing real numbers, so does accounting standards really matter here? Desperate to know the answer. FM, have a look at my comment below. Management fully clarifies situation on the call. $9.25 is their most realistic liquidation estimate, it has nothing to do with accounting standards. has there been any sort of correction recently in NYC real estate prices? wondering what your thoughts are on the conference call? thanks in advance! “WW investors indicated that they would charge incentive fees only after distributions to shareholders reach $11/share”.I am sure they have said that for a reason. So in the conference call management fully clarified that $9.25/share is the most realistic liquidation scenario and only small deviations from it are likely. As Fernando suggests, the $11 thesis is over. One thing I keep wondering about is whether investors were fooled by Winthrop into believing that far higher liquidation prices are possible, or whether Winthrop made a mistake themselves on this bet. During the call Wendy (CEO) continuously tried to distance herself from any clarifications of why Winthrop’s initial estimates are so far from the actual distributions. – I think the biggest difference comes from valuation of WWP and its option. I based by estimates assuming the whole WWP is worth c. $1000/sqf, which seemed to be conservative rate from landmark buildings in Manhattan. While the eventual sale price has not been clarified, management indicated that it will be far lower than that. – I put a lot of trust in Winthrop and their projections mainly because of their previous track record and the $11/share threshold for majority of the compensation. This trust appears to be misplaced for yet unknown reasons. I am holding my shares at a loss. Quite a significant portion of portfolio as I considered the downside to be well protected in here. With sale of most assets expected by the year end, share price should approach the distribution estimate over the next couple of quarters. There is also an idea floated by some that the estimate was intentionally low-balled, however I remain quite skeptical about that assertion after the call. Right. I guess my specific question was, in the past Mr. Ashner’s given out numbers that I think he expected to exceed with some confidence, is there some element of that approach to this number as well? Odds are the $9.25 NAV estimate is realistic. I listened to the call as well. One analyst accused Wendy of lowballing the NAV estimate to allow interested parties to buy stock on the cheap. Possible, but unlikely. I cut mine for a loss at $8.90. One thing to keep in mind is that this NYRT enterprise value is about 50% debt, 50% equity. So if the price of their real estate drops 10%, it hits the equity 20%. So owning this liquidation at the possible tail end of a real estate bull market is tough. Also unfortunately the commercial property brokers now know the price range that NYRT would be willing to sell its assets, so it may be hard to do way better. If they do liquidate NYRT for way north of $9.25, then you’d suspect foul play (but enjoy the check anyway). I am flat for now, interested maybe in the low 8’s. If the liquidation price is now pretty much known (9.25 USD / share), why is it trading 7.5% lower according to you? Fa, liquidation price is known approximately, it might deviate slightly from the announced $9.25 (but listening to Wendy, I do not think it is 8 / 11 range). As to why it is trading so much lower, uncertainty and remaining time till liquidation clearly play a role. Company expects to have fully liquidated the properties by Q1 2018 and potentially a quarter earlier. Also, investor disappointment with the recent announcement which contradicts everything Winthrop said so far, could have created some excessive selling. I assume the discount should narrow significantly after it is clearer for how much WWP will be sold. Does this not just come down to what the blended cap rate will be for the sale? I have not heard much dispute of the NOI figure used. Considering they have all the details. Considering the properties are fairly stabilized I am not sure how much variance on that exists. I know that the 1440 is vacant but sounds like that is taken into account with a lower cap rate on the property. So once again leads us back to whether we think cap rate is appropriate. Jason, I would disagree that the blended cap rate is the main reason for investor disappointment. Management is using blended cap rate of c. 4.5%, which is quite in line with most of the analysis I have seen. The main difference comes from blended NOI on which the cap rate is applied. Management is using $163m, which does not seem to include any rent free adjustments, vacancy stabilization and etc. Management references annualized Q2 2016 figures as their baseline. 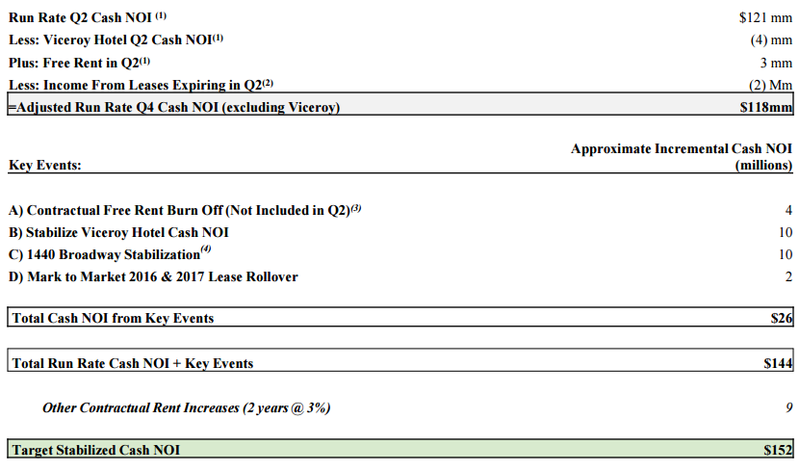 In Q2 2016 cash NOI was $121, adding on top of that 50% of WWP not owned at the time results in $161m-$165m (one analyst referenced $80m-$88m for total WWP and management agreed directionally). So you can see that management’s NOI clearly does not include any expected improvements, which were expected to be quite substantial in the range of $20m-$30m of annualized NOI. How likely is that buyers will take that into account? Fernando, my comment was mainly to point out the reason for the difference between initial liquidation estimates and $9.25. Management on the call sounded pretty confident on $9.25 as the most realistic liquidation estimate, which suggests that buyers are not taking into account the NOI improvements that were previously expected. Seems counter-intuitive, but that is the situation we have currently. With a current share price of $8.62, liquidation at $9.26 would translate to a 7.3% return. If sales proceeds are distributed by year end, the annualized return would be ca. 12.5%. If one were to buy additional shares now, it appears that the expected performance in the base scenario is above that of the overall market. My question is, is expected income (rents) between now and the liquidation date included in the liquidation estimate? Michael, as per conference call, it seems that income from properties till their liquidation is already included in the $9.25 estimate. Re annualized return, management will aim to sell the whole properties by the year end, however final distribution might also occur in Q1/Q2 of 2018. At the same time some of the distributions will likely be done earlier right after properties get sold. Therefore, annualized IRR is somewhere in between 7%-12% and will depends on the actual timing of the distributions. Biggest interday move up in a long time…..dead cat bounce or news pending? Do you have any explanation for this behaviour? New NAV $9.21 and stock still declining. Management did not provide any call with analysts and took an extra $1.2m on fees from the WP option… Thoughts here ? What should we make of the sale of 50 Varick, the reduced liquidation estimate ($9.21 down from $9.25) and then the subsequent drop from the $8.60 range down to $8.35? Given that this remains in Active Ideas, I assume that you have kept this position open and are simply awaiting whatever the results of the liquidation may be? Any thoughts on buying in again at the current price (or lower) to mitigate some of the loss? I still have the position and this drop in NAV is obviously disappointing, but it is a small amount ($0.04 only). Share price is dropping as the latest property sale happened significantly below the expectations, suggesting that other properties might also be liquidated at large discounts to BV. However, this is a tiny asset and might not be reflective of the remaining portfolio valuation. Liquidation of WWP will be the key here, so I intend to hold until there are any news regarding it. I think market confidence is completely lost in these guys. It was at least not bad that NAV held near 9.25, but hope they announce something quick. With a current share price of $8.17 and estimated liquidation at $9.21, the expected return would be 12.7%, and annualized return ca. 15-20% depending on timing of distributions. At what discount to NAV was the property sold that they sold already? I’m trying to estimate downside potential. The property that sold already was $2.5M less than projected, as I understand it. As for downside potential…all I can say is that I thought the same thing you’re thinking now, when it was $8.25, and now it’s $8.15 There has been a non-stop string of bad news on this stock, including the recent drop from $9.25 to $9.21, and then the subsequent announcement that China will be regulating investment in foreign real estate. The waters keep getting choppier…impossible to say where this ends up, because at this point, the only positive information we have is from the company itself, which has no credibility. Since the original liquidation thesis was flawed, wouldn’t it be in our best interest if they hold on to WWP until they bring up the NOI? That may give us an upside from today’s price, plus we get paid to wait via the rent coming in. Liquidation is happening disregarding whether currently it is in the best interest of shareholders or not – shareholders have already voted for it. If $9.21 NAV can be achieved after selling WWP, most of shareholders would be quite happy eventhough as you suggest the original thesis was flawed and eventual payoff will still result in negative return on the position (just less negative than selling shares in the open market at the moment). Any explanation for today’s move : -2.7% ? Management has been a complete disaster and cannot be trusted. I’m considering liquidating my position at a loss here. Share price is on the verge of hitting 7s and should easily do so once lawsuits start showing up in the headlines. What kind of lawsuits do you expect ? I am still quite surprised given the fact that everybody was initially expecting a liquidation value between $12 and $15. Turns out rumors were correct this time. Half of WWP will get sold at low valuation. This likely means that there were no buyers for the whole property. Not sure what will the company do with the other half of WWP. There is a conference call today that might shed some light on management plans as well as how this sales affects expected NAV. What I considered to be one the safest bests, is turning out to be one of the worst investments I have made. This entered into scam territory and lawsuits will start to come. I think Withrop real intention here is to stay as liquidators as far as possible and keep earnings fees, which are proportional to AUMs. They really do not care about NYRT shareholders or what ends up happening with the NAV. The only plan in their minds is earnings as much fees as possible. That is what I’ve gathered as well. While it’s possible they have been acting in good faith, either way this deal stinks of shadiness and will push out a large chunk of the WWP value until who knows how long. Either way I can live with the loss. Debt re-fi contemplated in the announced deal should not be ignored..may positively impact ability to sell retained controlling interest. Buyer has term sheet for $1.2 billion “qualified financing”. She claimed New York REIT received three final bids for the 1.8 million-square-foot tower ranging from $1.725 billion to $1.74 billion in June. But all three offers required the REIT to hand the tower over “unencumbered” by its existing $870 million mortgage, which carries a relatively high interest rate of 4.6 percent, has high amortization costs, prohibits the owners from taking out mezzanine debt and expires in 2023. According to Silverstein, getting out of the loan early carries a defeasance cost of $116 million. In other words: the $1.725 billion bids were really only worth around $1.61 billion — well below what NYRT thought the tower was worth. “The company is not simply forced to sell at any price,” Silverstein said. Instead she sold a stake, which has the advantage that NYRT can now use RXR and SL Green’s balance sheet and standing among lenders to refinance the tower with cheaper debt. The partners hope to land a $1.2 billion mortgage with an interest rate of less than 4 percent later this year. So the bottom line is that they are holding onto 51% of WWP, hoping to pump up its value and then try to sell it again. But this could take TWO YEARS. It’s telling that RXR paid $1.7b for just a half of the building. What this means is that whatever portion of WWP that NYRT has retained is pretty much worthless. Perhaps there is a handshake deal for a subsequent transaction. Seems they’re planning to seek a refi on the WWP mortgage once RXR becomes co-owner. Perhaps RXR didn’t want to take on the risk that the refinance would fail, but wil revisit once the mortgage is at a better rate. I’m at a loss for what to do. In the end, who knows if $9.21 is real, or if so, when that payment actually comes. 2019? Beyond? What happens if the real estate market continues to tank? Mustn’t this mean bad things for all the other holdings, too? This was a horrible investment. I have understood it slightly differently. I think the intention is to sell the other half shortly rather than waiting for two years until the full potential of WWP is reflected in new tenants/leases. Also RXR did not pay $1.7bn for half of the building – this was the valuation of the whole building at the price point RXR paid for their share. Wendy mentioned that current transaction does not change NAV estimates, but I agree that market seems to declining from it’s all time highs and this obviously might affect NAV eventually. I see–sorry, you’re right, I was confused about the $1.7b valuation versus price actually paid. As for the timeline–I concede I’ve only read summaries of the conference call, but from what I’ve read/heard, Wendy S. at least contemplated placing the held stake of WWP into a liquidating trust. I gather that the effect of this arrangement would be give them more runway, past the 2019 liquidation deadline, to rejuvenate the value of WWP. Under this scenario, payout could be years away, rather than months. Payout is probably years away, might have to ride NYRT through an entire cycle. And remember small moves in the cap rates can cause major moves in the equity values of leveraged real estate…. If price and net asset value decline by a two dollar distribution in November, the remainder leaves a 25% yield to maturity based on my calculations. That’s a big number. I would expect the market price to adjust somewhat as the distribution gets closer and more certain. Two further properties to be sold for $550m. How does the sales price compare to the latest estimate before the sale that corresponded with the $9.21 (?) target? I really do not know as company has not itemized individual asset valuations in their liquidation plan. As the company has not issued any statement regarding this, I assume the sale value is at or below the earlier estimates. 10-Q to be issued in Nov will hopefully will shed more light on this. they should be writing something like “these are consistent with the company’s estimate of NAV”. if not, its probably less! I have no opinion and am staying on the sidelines. But I have always liked the way he thinks and thought worth sharing. I guess we’re all just along for the ride! Let’s see how low it can go!!! Seems like Winthorp is failing on every single promise they made for shareholders in the proxy fight. First distribution of $2.07 will take place at the end of November. I have sold out of the position at 28% loss. Why are you selling @ $6.85? I understand that Winthorp has failed delivering but now, the game is pretty much over. According to you, there is still room for more negative news flow? Main reason for selling is that in the base case scenario I stand to gain only 15% after 4 years from holding on to this position. Before this announcement the timing was counted in months not years. I have no idea whether there is room for more negative news – so far only half of net asset value has been sold and even-though the value of remaining properties has been adjusted downwards already, there could definitely be further surprises down the road, especially with extended timeline. Glad I sold earler, though I should of sold when they first reduced NAV to 9.21, hindsight is always 20/20…. If there’s one thing I learned from this situation, it’s when management starts smelling like they’re full of it, get out. Confirmation of this for me was when they sold just 49% of WWP. I gave them the benefit of the doubt at first, but by selling just 49% of WWP, this could only mean one thing, the remaining 51% of WWP would not be sold for who knows how long. And of course today confirms this is exactly what is happening. NYRT is a clear example on why Buffett insists on investing with management teams with proven track record and a history of shareholder friendly actions. I think the real confirmation to exit was when management in Q1 announced first NAV estimate of $9.25. That inmediately smell that something abnormal was happening… why running a liquidation when a few weeks ago shareholders can sell shares at even higher prices on the open market. Do you have an ETA for the delisting? So my expectation is that this will happen in Jan 2019 or potentially earlier. There will definitely be further announcements regarding this when the date approaches. – by my calculations only c. half of properties included in $3.84 have been sold (now a bit more after another sale reported this morning). The rest are at risk. – this management keeps on disappointing and does not seem to have a good handle on situation. Just 4 months ago and after the first asset sales they assured investors that NAV of $9.21 is unaffected. This proved to be very wrong. The same regarding timing on the sale of the remaining 50% of WWP. I do not trust their estimates or words that only $0.7/share is at risk. – Sale of the remaining 50% of WWP remains questionable – why nobody wanted to buy it now? In 4 years anything can happen. Maybe sale proceeds will only be sufficient to cover the debt. The whole initial thesis was based on fast and successful liquidation that will be carried by operator with a good track-record. Thesis failed on all 3 aspects (slow, unsuccessful, bad operator). Potential upside in rosy scenario no longer justifies holding the position. I might change my mind if the remaining sales progress as expected. There also should still be further opportunities to enter the trade after couple dividend distributions and right before delisting. I mostly agree with this post. Managements poor track record, the extended time horizon, and the high probability that you will have to own a delisted security have driven price down to where it could be argued it is mispriced. I did not see managements discussion of payout timing of the 3.84 if anyone caught that? I spent a few hours with the 8k and the conference call transcript and here are my impressions. The 2.07 is a done deal and most of the 3.84 is a done deal. Yes there is 70 cents in the 3.84 that is at risk but they went out of their way to discuss how tough things were looking for Viceroy hotel so one would think they have a pretty real expectation on what they will get. My biggest positive from reviewing the info today was that the assumed value of 2 billion in four years includes the investment of 160 million….so if they get a dollar for dollar return on this investment it does not require much appreciation to get to 2 billion. This exact point was made by an analyst and addressed on the call. I agree that the downside risk is now quite limited which was not the case when multiple investors bought NYRT to play the liquidation since Dec 2016. However, I don’t see your upward potential of 3 once the liquidation dividends will be paid. In fact, the management in place has been quite disappointing and as his base case scenario is now 8.5 – 5.9 = 2.6, I would consider this pay out as a cap. Same thing for the .7 still at risk which could turn to 0.4 or 0.3 in June or September 2018. So instead of investing 1 and getting 2.6 to 3 given management historical performances, I would consider investing 1 to 1.4 and getting 1.8 to 2.6 maximum with unlisted asset over 4 years…. Am I too conservative …..or not enough conservative? I dont agree at all. I sold above 7, but at this point it would be extremely foolish in my opinion to continue to hold. The rest of the distributable value of NYRT (the 51% share of WWP) is still in completely control by management, who have beyond proven they are value destructive. It would not be beyond them to drag out the sale for the rest of WWP to simply continue collecting fees for as long as possible. Management should be dragged through the streets. Do you really think it’s smart to hold equity in something like this for a 10-15% gain over 2-4 year??? You’re money is better off else where.